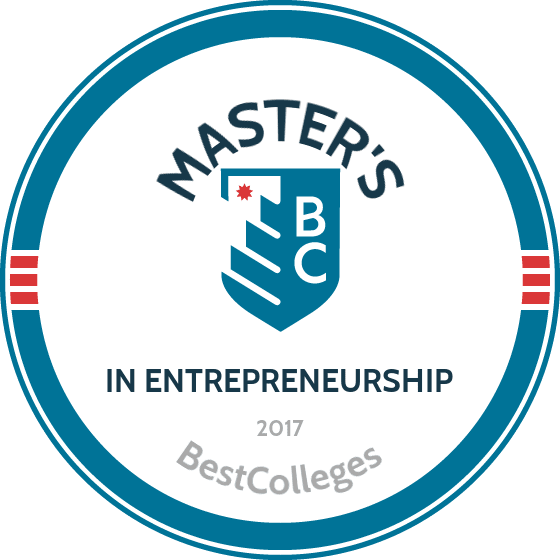 WHAT ARE THE BEST ONLINE MASTER'S IN ENTREPRENEURSHIP PROGRAMS? What Else Can I Expect From an Online Master's in Entrepreneurship Program? Earning an online master's in entrepreneurship allow graduates to pursue careers in a variety of growing and thriving job fields. The Bureau of Labor Statistics reports a 14% growth rate for jobs in the management field, and a 19% growth rate for jobs in marketing analysis. Graduates have the choice of either pursuing a career in one of these fields or starting their own startup business. With all of the great options available, choosing the right online master's degree in entrepreneurship can seem like a daunting task. Below, you will find useful information and guidance to help you select a program that fits your career goals. Yes, this degree can provide you with the skills needed to advance your career in business. Students learn how to start their own business from the ground up and also how to contribute to the growth and development of an existing business venture. While admission requirements will vary from school to school, many social entrepreneurship master's programs do not explicitly require previous work experience for admission. However, previous work experience is often noted as desirable. When choosing an online program, it's important to consider your lifestyle, career goals, and what you would like to get out of a master's program. Each program will have its own unique design and requirements, which makes it even more important to find one that you find one that meets your needs. Some factors you may wish to consider are whether courses are delivered asynchronously, or synchronously, the time commitment to coursework each week, and whether or not there is a residency requirements. CAN I WORK WHILE I COMPLETE MY ONLINE MASTER'S in ENTREPRENEURSHIP? Yes, most online programs are designed with the working professional in mind. Programs that allow students to study on a part-time basis can be especially friendly to full-time professionals. Founded in 1856, the University of Maryland is not only one of the most well-established institutions in the United States, the school is also rated as the top public university in technology entrepreneurship. The comprehensive, experience-based master of professional studies in technology entrepreneurship offered at UMD is just one of many graduate programs the university offers entirely online. The self-paced MPS requires just 15 months of full time enrollment, made up of 30 credits and nine courses. This affordable online master’s in entrepreneurship program also provides students with the support and resources of UMD's global alumni network, both during and after their studies. The entirety of the program is available online and in an asynchronous format. The school makes video lectures available so that students can watch them at their convenience, and live video conferences at the start and end of each semester are also flexibly scheduled in individual and small-group formats, based on the student’s availability. The program offers opportunities for funding through investors in the field. Based within the Martin J. Whitman School of Management, the master of science in entrepreneurship offered by Syracuse University is delivered in an entirely online format. The 10 course, 30-credit program provides students with the skills necessary to excel in all kinds of entrepreneurial ventures, from running a family business to developing and launching a startup. The program highlights select courses from the university’s MBA program that concentrate on business strategy, finance, and marketing. This online master’s degree in entrepreneurship is comprised of face-to-face online courses and interactive, self-paced class work, and students often complete their degree in as few as 15 months. Applicants to the program are uniquely required to provide a sample business proposal along with their application. The one-page proposal accompanies a personal essay, and focuses on the overall business concept. With two start dates per year, admissions are granted on a rolling basis. In as few as 15 months, students can earn their MS in entrepreneurship and innovation through Indiana University’s unique online program. The program offered through IU Bloomington is made up of 30 required credit-hours, including three in-residence experiences designed to immerse students in entrepreneurial discourse and practice. Kicked off by the one-week Global Startup Challenge in Bloomington, the program can then be mostly completed through online distance learning. Students also have the unique opportunity to pursue studies abroad in the university’s AGILE program, or to complete a virtual consulting project with a new startup or existing business. Students must complete the program's in-residence experiences before receiving Indiana University's master’s in entrepreneurship at Indiana University. However, these requirements make up only a small portion of the program's curriculum. Other courses are available entirely online, including strategic entrepreneurship, financial management, and game theory and business strategy. Oklahoma State University's gears its online master’s in entrepreneurship program specifically toward students looking to enter the non-profit, for-profit, public sector, and military arenas of business. Made up of 33 required credit-hours, the entirely online program takes about two years to complete, based on full-time and summer enrollment. OSU’s online program offers unique opportunities for in-person immersion in various entrepreneurial experiences, depending on the student’s individual geographic location and interests. These opportunities include the Riata Business Plan Competition, the Technology Commercialization Project, and the Women Igniting the Spirit of Entrepreneurship program, among others. Applicants to the program should have a minimum GPA of 2.75 from all undergraduate work, and entrepreneurial experience is preferred but not mandatory for admission. A military tuition rate is offered for active duty service members. While perhaps best known for its highly regarded online MBA program, the University of Houston-Victoria also offers an excellent master's of science program focused on economic development and entrepreneurship. This master’s in entrepreneurship is offered entirely online and is ideal for distance learners and those already working in the field. The 36 credit-hour program places an emphasis on start-up creation and development, as well as working on the basic fundamentals of business growth. The program’s dual focus approach provides students with the skills to be specialists and professionals in both entrepreneurship and economic development, allowing graduates of this program to enter the field ready to start their own business or work to grow an existing one. UHV's program boasts one of the lowest tuition rates among Texas-based universities, and is fully accredited by the Association to Advance Collegiate Schools of Business. Each school will have its own unique curriculum and required courses. However, there are some common classes that you will find in any online master's degree in entrepreneurship curriculum. Below is a sample of a few courses that are offered in any master's degree in entrepreneurship online. Financial Management: This course provides students with a comprehensive look at the different tools and conventions used in the arena of corporate and business finance. This course may also cover areas such as financial theory and analytical reasoning, both of which are important for solving and understanding business problems. Strategic Marketing Management: This course teaches students how to use a better understanding of marketing strategy, analysis, and research to achieve success in their organization. Students learn how to create and develop products and services that are tailored to the current needs of the market. Launching Startup Ventures: This quintessential entrepreneurship course prepares students to create, develop, and launch their own tech-based startup venture. HOW LONG DOES IT TAKE TO GET AN ONLINE MASTER'S IN ENTREPRENEURSHIP? The amount of time it takes to complete an online master's in entrepreneurship can vary from program to program. There are a number of factors that can cause a program to take more or less time to complete, including the number of credits in the program and whether students can enroll either full-time or part-time. For online programs, it also depends on whether courses are offered synchronously or asynchronously. In general, an online master's program in entrepreneurship requires between 30 and 36 credit hours to complete. Most of these programs can be finished in as few as 15 to 24 months with enrollment in the spring, fall, and summer terms. When searching for the right master's in entrepreneurship online program, be sure to choose one that is fully accredited. Schools are more likely to receive regional accreditation, though some are accredited nationally. There are a number of regional accreditation agencies in the U.S., including the Higher Learning Commission. This commission accredits schools in 19 north central states that meet its specific academic criteria. You may also want to find a program that has discipline-specific accreditation from the Accreditation Council for Business Schools & Program, one of the major governing agencies for assessing and accrediting business programs. The U.S. Department of Education (ED) is a government agency that handles policies in the school systems in the United States. The ED is also responsible for providing aid and assistance to students who fill out the Free Application for Federal Student Aid (FAFSA). The ED and the Council for Higher Education Accreditation both provide a comprehensive list of their recognized accredited institutions on their websites. Graduating with a master's in entrepreneurship opens doors to a variety of career options and a higher potential salary. Entrepreneurs also report a high rate of job satisfaction, making a career in related fields even more attractive. Below, you will find salary information for a selection of potential careers that are common among graduates of master's programs in entrepreneurship. These salaries are based on national averages for these specific jobs. As you can see above, salaries in entrepreneurship tend to be much higher than the national average. However, these salaries vary depending on a variety of factors, including where you live. The cost of living and quantity of roles in an area are two of the main factors that can influence the average salary in a particular state. Below, you'll find a table outlining the top five paying states in the U.S. for graduates with a master's degree in entrepreneurship. Graduates from a master's in entrepreneurship degree program can look forward to a wide range of job opportunities and potential business ventures. In fact, one of the first big questions a graduate must answer is whether they want to start their own business or pursue a role in the business field. By necessity, entrepreneurs are dedicated and hard-working professionals, as many potential career paths are very demanding. Below, there are a few examples of common careers these graduates can pursue. A high average salary and faster-than-average job growth rate make management analysis an optimal field for graduates with an online master's in entrepreneurship. Management analysts are tasked with optimizing the way a company functions and aim to make their organizations more profitable by finding ways to minimize costs and maximize efficiency. Working as a buyer or purchasing agent is ideal for those who are interested in a sales-based role. These professionals purchase products and services that their business can resell. They are responsible for negotiating prices with suppliers and monitoring product quality. These analysts watch market trends to determine how a certain product or service will potentially perform and sell. They also look at the things that buyers are looking for and how much people are willing to spend on these products. These professionals excel at collaboration with others, including art directors, financial staff, and sales agents. They focus on developing programs to create an interest in the services and products offered by their business. Financial analysts look at market and stock trends to evaluate how businesses and individuals should invest their money for the best return on investment. Within a business, they are tasked with making investment decisions in regards to bonds, stocks, and product development. Students in graduate programs can take advantage of the resources that professional organizations provide to network, learn about internship opportunities, and broaden their knowledge of the field. These organizations can connect graduates with job opportunities and often offer conferences and professional development events to keep members well-connected with other professionals in the field. Below, you will find a few examples of prominent professional organizations for entrepreneurs. This organization aims to connect women business owners and create an outlet for sharing ideas, networking, and creating a support system for all members. The YEC not only provides networking and idea-sharing opportunities for budding entrepreneurs, but it also provides members with discounts at major business supply chains and on travel-related expenses. This organization focuses on research, education, and outreach in the field of entrepreneurship. Membership in this organization provides subscriptions to important entrepreneurial publications such as Entrepreneurship Theory and Practice and the Journal of Small Business Management. Even though an online master's degree is typically cheaper than its on-campus equivalent, many students still require financial assistance. Fortunately, most online schools offer a variety of financial aid options to online students. The first step is to fill out the Free Application for Federal Student Aid (FAFSA). Students applying for financial aid with FAFSA must be enrolled in an online master's program that has been accredited by a federally recognized accreditation agency. Students enrolled in entrepreneurship programs might also consider applying for program-specific scholarships through major organizations in their field. Large corporations and companies may also offer paid internships that students can complete while earning college credit.